Mashhad is a metropolitan city in northeast of Iran and the center for Khorasan Province. 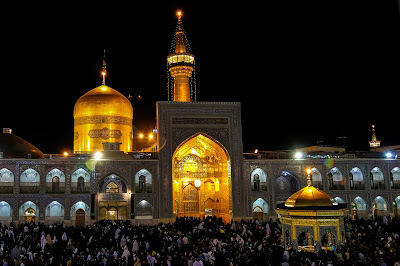 The most important shrine in Mashhad is the shrine of Ali Ben Musa Al-Reza, the eighth Imam of the Shia. The annual number of pilgrimages to the shrine are 30 to 35 million people. Astan Qods Razavi Museum, which also includes several museums, is located in the shrine complex. The complex is 70 hectares. It has 26 porches, 9 courtyards and 6 entrances. After testimony of Imam Reza, he was buried near the tomb of Harun Al-Rashid. This tomb was repeatedly repaired and decorated. But the first tomb on the shrine of Imam Reza was installed in the reign of King Sanjar. The dome is made of tile works with mirrors which remained up to now. King Mohammad was also one of those who decorated the dome with finest tiles and ordered to construct two sanctuaries. The dome minarets were built in the reign of Ghaznavid under the order of Moataz, the governor of Shiraz. Shah Abbas and Solomon were the kings who were involved in the reconstruction and development of the shrine. King Tahmasb restored the dorm minarets and gilded the shrine. He covered the brick tiles with gold. In Qajar period, special attentions were made to the shrine of Imam Reza and the third shrine was built during the reign of Fath Ali. But a large part of the development were made after the revolution of Islamic Republic. While traveling in Iran, do not miss this religious city.